The horse business can be busy and stressful. Most professionals work or are on call 7 days a week for many hours in the day. 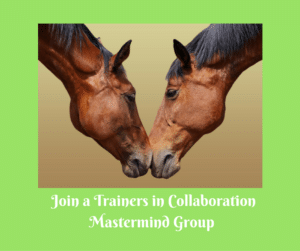 Becoming part of a Trainers in Collaboration Mastermind Group is a great opportunity for you find support from other trainers and equine professionals, share ideas and combine your knowledge and experience. I worked full time in the industry for over 35 years and would have loved to have had a group of other equine professionals to help support me. So I developed this masterclass to help today’s equine professionals and give back to the industry. The purpose of the group is not for me to coach you all, but instead be a facilitator for all of you to bring together your expertise, support, thoughts, struggles and needs that you have with your students, your clients, your businesses and with finding balance in your personal lives. I will bring my coaching skills along but you will all be the ones in the driver’s seats as you are the experts. Each group has 9 teleclass sessions over 3 months. The first session is a get to know each other session. The next 7 would be set up so that each person in the group gets the opportunity to bring a topic to discuss for your week that is important to you. The final session would be a wrap up. These would all be done via Skype/phone and recorded so that if you can’t make a call for some reason you can still hear the call at a later date. Even if you were on the call you will be able to go back and listen again at any time if you choose. I will also be setting up a closed Facebook group that will be ongoing, where you and future group members can stay in communication with one another. New groups will be started regularly. The next group will begin in January. Please fill out the contact form below to get on the list for the next session. I will contact you with more information and add you to the list if the class is not already full. Once it becomes full you will be added to the waiting list for the next session. The exact start date for the January sessions has not been set but sessions will be held on Monday evenings. I am looking forward to meeting a new group of professionals and being a part of you all supporting each other in your success! The fee to join this great opportunity is $129! !